Chicken Noodle Soup (Stocking the Freezer #2). Confession: I have yet to master the art of roasting a whole chicken. I feel pretty lame about it, since it’s one of my favorite meals! The last time I attempted it my chicken was undercooked, and kind of pink and slimy inside. Really gross and really sad. It’s hard to rescue dinner at that point, and I’ve been gun-shy ever since. But you guys. I can boil the heck out of a chicken, and that’s what this recipe is all about. It’s also about having some cooked, shredded chicken in your freezer – which is a great starting point for so many meals! You chop up a whole chicken, put its parts and pieces in a big pot with water and veggies and herbs, and cook it until it falls right off the bone and leaves you with delicious chicken stock and the makings of the most homey, comforting, and satisfying chicken noodle soup. Prepped and ready to go! I leave the celery in those big chunks to make them easier to fish out of my three-year-old’s bowl, since she loves this soup as long as there’s no celery to taint it! Bring your pot to a boil, then reduce the heat and cook, covered, for 1-1.5 hours. Use a slotted spoon to remove the chicken pieces from the broth and set them aside to cool for a while. Set a mesh strainer over a large bowl or measuring cup and carefully pour the stock through the strainer, reserving both the broth and the vegetables. I put the measuring cup in the sink in case of spills. You should have about 5 cups of beautiful chicken stock! You can skim off the fat if you want; I usually just skim enough to use in the roux later on. Up to you! Next, shred up the chicken. In my experience, this is SO much easier than picking a roasted (or in my case, Costco rotisserie) chicken – the meat comes off the bone so easily and it’s easy to get rid of the skin and…whatever you call the other bits you don’t wanna eat. My chicken yielded about 5 cups of meat, and I used half of it in the soup and put the other half in a freezer bag for future soup (or casseroles, or quick quesadillas, etc). I poured half of the stock back into the pot and put the other half into another freezer bag. There’s just something special about real homemade chicken stock and its gelatinous, mineral-ly, flavorful goodness (check out this article about the health benefits of bone broth!) and so I like to have some of the good stuff when I make soup. Then I added 2 cups of water and a tablespoon of Better than Bouillon chicken base and brought it back to a boil to cook the noodles. I don’t usually measure the egg noodles, but I did for you. I used 1.5 cups (solely because that was what was left in the bag, but it was a good amount for the finished soup! If you like a lot of noodles or need to stretch the soup to feed more people, feel free to add more). My noodles needed to cook for a total of 7-8 minutes, so I set a timer for 6 minutes and made a quick roux (fat, flour, milk, and a little more broth) to add a hint of creaminess to the soup. When the timer for the noodles went off, the roux was ready to stir in! The roux is totally optional, but we love this hybrid brothy/creamy version. Add back the veggies and chicken, and let it simmer for a minute or two – and you have a pot of hearty, savory, not-too-creamy soup, with onions and celery that are meltingly tender, sweet carrot circles, and plenty of the chicken and noodles that make it a real meal. 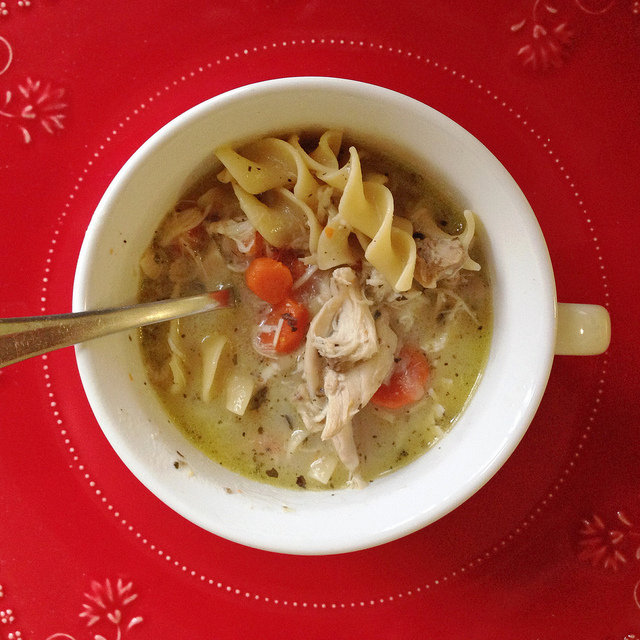 I hope you enjoy slurping a bowl of this chicken noodle soup as much as we do! And pat yourself on the back for making your life easier on another night by stashing that chicken and stock in the freezer! Yield: 3-4 servings; this isn't a huge pot of soup! Place chicken pieces and veggies in a large pot and cover with water (about 6 cups). Add seasoning and bring to a boil over high heat. Reduce the heat to medium and cook, covered, 1 to 1.5 hours. Remove chicken pieces with a slotted spoon and set aside to cool. Set a mesh strainer over a large bowl or measuring cup and strain the veggies from the broth, reserving both. If desired, skim the fat from the broth. (I skim enough to use in the roux later on, but leave the rest since it’s just a few tablespoons and I think it adds flavor.) When the chicken is cool enough to handle, shred the meat and discard the bones and skin. Add half of the chicken stock back to the pot, reserving half in a freezer bag for another pot of soup. Add water and chicken base. (If you don’t want to freeze stock, just pour it all back in the pot and omit the additional water and chicken base.) Bring it to a boil and add egg noodles, cooking them a couple minutes less than the package requires (I did 6 minutes). Meanwhile, melt butter in a small saucepan (or reserved chicken fat if using). Whisk in flour and cook for a minute to form a roux. Slowly pour in milk, whisking, then broth, whisking until it bubbles and thickens. Add it to the soup, then add half of the shredded chicken and all of the reserved vegetables (first sort through them to make sure there are no bits of bone, etc). Let the soup heat together for a couple of minutes, taste and add salt and pepper if needed, and serve! If you prepare the soup as stated above, you will have the meat from half a chicken and about 2.5 cups of stock to save and freeze for a future meal. Alternatively, you could use all of the stock in the soup and just save the chicken for a casserole, etc! Crockpot Chicken Tortilla Soup (with crunchy baked tortilla strips). Those giant, retrievable celery chunks crack me up! Oh, what we do to graciously accommodate our families’ tastes! I love the idea of adding a little roux to this — so clever! Bet–I have a fail proof roast chicken recipe–it’s one of Jeff’s favorites! We will have to discuss! We ate this for dinner tonight and 3 out of 5 people loved it. 1 person ate it grudgingly and 1 person cried copious tears when she saw her bowl. After much weeping, wailing, and gnashing of teeth, she tasted it. And admitted, “This is a TEENY bit good.” She even ended up eating most of her bowl, as a bribe for half-slices of bread. But the bribery was fulfilled cheerfully, so I’m gonna call that a victory. Haha! Well, that’s better than us last night when I served leftover pot roast and L said – “Why am I having this again?” Umm, because it’s pot roast and it’s delicious?? Also, I haven’t made bread in a LONG TIME and I’m very jealous of yours!! This really is the most delicious chicken noodle soup. It’s become a staple around here, and I hardly ever made this kind of soup before. That creamy roux just rockets it up above regular chicken noodle soup! I keep putting it on our meal plan and then making something that’s less of a process, instead. But it’s really so worth it because you have that extra chicken in the bank!! Plus it’s sooo goooood.